This entry was posted in Academic achievements, Students and tagged scholarship on October 28, 2013 by Wire Eagle. AUBURN – Auburn University senior Patrick Donnan has been named a finalist for the highly selective Marshall Scholarship for an opportunity to study in the United Kingdom next year. He will interview at the British Consulate in Atlanta Nov. 12 to possibly be chosen as one of only 40 U.S. students named a Marshall Scholar and to attend their choice of any U.K. university. Approximately 900 students are endorsed annually for the scholarship by their respective universities, with 160 being named finalists. 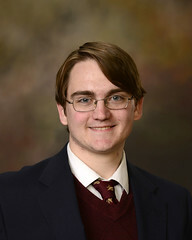 Donnan, a native of Auburn, Ala., is a student in the Honors College double-majoring in physics and music, concentrating on the bassoon, and minoring in mathematics. He is also an editor of the Auburn University Journal of Undergraduate Studies and a 2013 Barry M. Goldwater Scholar. He conducts research in the College of Sciences and Mathematics’ Department of Physics as a member of the theoretical and computational atomic physics group. The Marshall Scholarship program was established in 1953 by an act of British Parliament in honor of U.S. Secretary of State George C. Marshall as an expression of Britain’s gratitude for economic assistance received through the Marshall Plan after World War II. The program is overseen by the Marshall Aid Commemoration Commission.